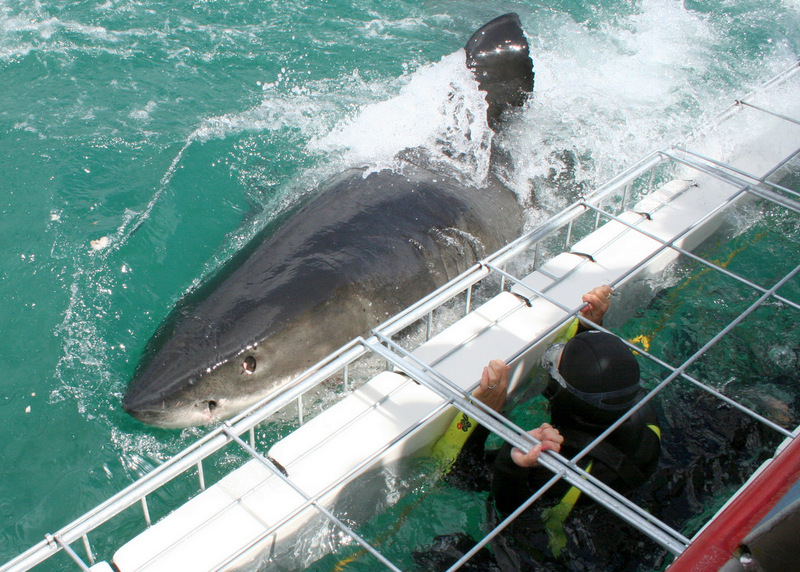 One of the best places to view the great white sharks, daily great white shark cage diving & sighting tours are offered off Gansbaai. Approx. 12 km offshore from Gansbaai we find two islands situated next to each other. Due to a number of geographical reasons – one being the shallow and narrow channel that runs between these two islands – Dyer Island has become known as one of the most unique areas in the world, to successfully view the great white shark. Swim costume, camera, sunscreen, hat and jacket. PLEASE TAKE ANTI SEASICK TABLETS WELL IN ADVANCE IF YOU ARE PRONE TO MOTION SICKNESS. Breakfast is provided at The Great White House before the boat launch. Michael Scholl provides an extensive and focused educational briefing before each trip. With 8 years of shark research experience around Dyer Island, this briefing is full of interesting facts about the behaviour of the great white shark. We are the sole company working with marine biologist/scientist, Michael Scholl, from the White Shark Trust who accompanies our trips out to sea. Passengers are fitted with comfortable inflatable life-jackets. Safety is of the most important aspect of our operation. We have extensive public liability insurance. We usually launch around 9:00 am in the morning (note that launching times may vary due to tide and weather conditions), arriving at the anchoring spot in 20 to 25 minutes. The anchor is lowered, the cage goes into the water, a scent trial is made, and we settle down.After this exhilarating trip, we return to the Kleinbaai harbour to enjoy some refreshments.